WARNING: LONG POST. I even edited it! This one prompted a great deal of thought though and so I've got to go with what is written. 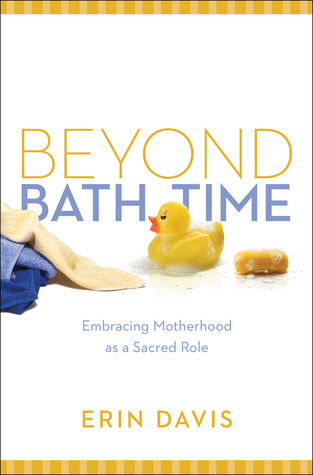 Two pages into Beyond Bath Time : Embracing Motherhood as a Sacred Role and I was pretty confident that I was going to be purchasing a copy for everyone I knew. By the end of the book I wasn't as fond, but I think generally speaking, my opinion of it is still good. In today's society, when motherhood is looked down upon and is, in fact, discouraged - this book is quite a valuable tool and resource. I realize that this post is going to be "speaking to the choir" more or less, since most of my regular readers here are stay at home moms like myself. You know the joys of being a mom, and you also know there are innumerable challenges blessings involved. You'd walk through fire to do what you do because you understand that being able to stay home and raise children is a privilege. You also know that society does not agree that you are using your time very well and you feel as if you are swimming against the tide trying to convince people that children are a blessing from the Lord. You know that you can't actually afford to stock your pantry with bon bons and that no matter what it looks like to other people, it is of grave importance that you still make time to read. (Ahem.) You also likely do not own a tv or keep regular appointments with it. (Whatever shows you do watch, you tend to enjoy post-children's bedtime.) I hear you. I get it. I know what your arguments are before you make them and you know mine. If you would like validation for your sacrifice, then Beyond Bath Time will provide it. In this book, author Erin Davis addresses the lies that society has fed us about why the role of motherhood is one that can and should be avoided if at all possible. If you are of the mindset that motherhood is unimportant or that you cannot justify the idea of staying home and "merely" raising children with your life, then you might consider reading this. It may challenge your opinion on the importance of motherhood, for Erin Davis desires to develop within the hearts of women (in particular) a love for the role that they have been called by God to fill. If you are one of the first stay-at-home moms in your family, then you also might be incredibly encouraged by this book as it will most definitely affirm your decision and foster the desire to mother. I believe that Erin Davis has a lot of good things to share. During the first seven years of her marriage, she didn't want to be a mother. When she finally became pregnant, she cried as she told her husband about it. Becoming a mother and embracing that role was not something that came easy to Davis. She freaked out and then learned to cope - and thrive! She is not a perfect mother and readily admits that mothering is hard work. She maintains though that it is beautiful work as done before the Lord. She offers encouragement to moms who are weary in well-doing. She encourages mothers not to just look at what is "right now" - but to look at the big picture of what they are doing when they decide to become mothers and focus their life's attention on training up children. Don't I know it! Any Christian mother who decides that she is going to stay home and raise her children (and then maybe even home school them!) is well aware that she is surrounded by people who do not like what she is doing. Such a mother is surrounded on all sides (by believers and unbelievers alike) who question her sacrifice, challenge her beliefs, mock and deride her and fail to offer her support in raising up not only little members of the Body of Christ, but future members of society! (And you should hope and pray that those future members of society are well-trained and productive or else you are going to have a heap o' problems to deal with once they are set loose!) But this: no matter how big and scary the naysayers make themselves, the Christian home maker/SAHM/home schooler has the assurance that God is with her and will help her leap over countless roadblocks and stand victorious (and blessed) in the end! (See Psalm 18:29 for encouragement.) Encouragement is precisely what Davis wishes to offer to the reader and she does so. Therefore I like the book. All throughout the first half of the book I was in a state of love with it. Then I read the concluding chapters and became less enamored. I do think that's in part due to the fact that my personality is distinctly different than Davis'. First, I must tell you that I am a big proponent of a mother/family having a support system. I think being around like-minded people and having friends who can come alongside you and motivate you in a scripturally accurate way is incredibly important and valuable. Thus far, Davis and I agree. She focuses heavily on the idea of a spiritual "sisterhood" that got a little too flippant and ridiculous sounding to my personal taste. It is here where I make my confession: I dislike the term play date and am virtually guaranteed to decline going on one if ever asked. I can't stand the term because it sounds like some sort of arrangement where the mothers get together to gossip while the children wallop each other in the fore or background. Personally I dislike suggesting that the only reason I'm going to get together with another mom is so that our kids can have some playtime. If I'm going to get together to really fellowship with another woman, I'm inclined to have a "ladies night out" rather than a "play date" because then I can focus on having a genuine and uninterrupted conversation with my friend. If my children are present, I am almost completely focused on training them how to behave. There isn't much time to relax. (Also, if I'm in a "play date" situation and I see someone else's kid needing some instruction I have a hard time relaxing.) "Play dates" are not for me. Davis rather encourages them. She also makes a point of talking about the benefits of Twitter (hey, you can even Twitter info about this book!) and Facebook (hey, you like the book's page!) and the like. It was a little too sales pitch-y and not very genuine in offering scriptural guidelines for pursuing Biblical fellowship with other females. We definitely differ on the ways and means which we seek out encouragement but we both agree that such encouragement is needed. I'm just not on the More Power to the Sisterhood Bandwagon that I feel she is on. This is probably about as much of my own personal thoughts as you can handle at the moment and I should draw this to a close. I thought this book was really interesting though. I devoured it quickly and am generally approving of it, with the stated exceptions. Thanks, Moody Publishers, for shooting a copy of this one my way. Excellent food for thought and a great testimony to a society that regrets life and dismisses life givers. Appreciate it! So, while I cringe at the term "play-date," on the other hand I think it is valuable and fun to get together with friends in a natural way. I agree about the term "play date." It needs to go. And I am FASCINATED by your opinion about play dates. Never thought of them that way before. It's interesting to find someone who finds "play dates" annoying. I can say that the whole concept is unworkable for those of us with five kids of various ages. Perhaps in theory, there is another family with kids the right ages to give each of my kids someone to play with - but we haven't met yet. The male approach, as you might have noticed, is to find an activity (say hiking - or museum visit) and make that the foundation of the get-together. The kids have something specific to do, and are therefore easier to supervise. Plus, the guys get to talk a bit - which is enough for us. Your review reminds me of my friend who rants about calling your husband watching the kids "babysitting". I find it interesting how people perceive different terms. I joined the mom's group at my church shortly after M was born and am finally to the point where I have made quite a few friends and made some deeper friendships. I'm thankful for the older moms who are willing to tell it like it is and provide their wisdom when I need it. This past winter was so good for my spiritual growth as a wife and mom. Hmmm.. I think success of playdates depends on who you are with. I like them because it gives my children opportunities to play with children other than their siblings and practice social skills in a larger context. I also like play dates with families that have children of all ages because my kids need to learn to interact with people of all ages - not just their specific peers. However, I should say we do not have a lot of playdates, and those we do are usually centered around an activity - zoo, museum, picnic, hike, etc. I also think playdates before your child is 3 yrs old is really for mom and has nothing to do with the child, since infants and toddlers use parallel play rather than playing together. Interesting book and discussion. Hey there fellow moms! Erin here, author of the book, "Beyond Bath Time." Thanks for the kind review, Carrie. I'd be happy to send some free copies your way for you to give away to your readers if you'd like. Interesting discussion here about playdates. It never occurred to me that some moms consider this a problem area. I so love getting together with other mom friends who strengthen and challenge me while our children learn to play with others, but it is good for me to know that this doesn't work for everyone. The point is that we need each other moms. So..let's find ways to be iron sharpening iron with other moms and continue to hold on to God's call to mother with Kingdom priorities. My take on play dates is similar, but different. IF I find that I like a woman and want to know her more, I may invite her and her children over so that we can ALL get to know one another better. I must say, I have never had just one visit with a woman like this...a relationship has always formed. Unlike you, I can typically relax while the kids play...addressing situations as they arise...and know the meltdown at goodbye is likely. Alison-- OH, I am going to agree that dads do not babysit!! Dads are NOT babysitting. Hello. I'm not sure if I'm being slightly misunderstood here... I DO think it is important for women to have fellowship and I also think it's important for children to have fellowship with other people. (I think children should learn to relate to people of all ages though so I'm not particular about finding someone exactly their age to play with.) Children learn through interactions with people other than their parents. This is true. At the same time, I'm bothered by the lack of discipline that I see in the lives of many small children. I've had too many instances (not many, but TOO many) where the children are off playing and the other kids are hurting mine. Play time isn't "beat you to a pulp" time and I don't think little kids (ages 5 and under) should be running off unsupervised. I like to keep an eye out so that I can step in and teach them in their interactions with others who they ought to behave. I think that's incredibly valuable also. They will learn how to behave from me, hopefully, and not from their fellow two year old who decided to take a whack at them. We do not hit each other in this household and fighting and hurting are not tolerated. Play dates, as they are frequently played out (har har) seem to lend themselves to situations where bullying occurs and I just can't stand for that at all. As many of you have pointed out, gatherings with other mothers and children shouldn't be all about the kids. It's important to be with another mom who you have a true and genuine relationship with so that you can have true and honest fellowship. I once met a lady at an event who I hit it off with. I talked to her - briefly - on two different occassions. I thought I MIGHT like her but I really knew absolutely nothing about her except that we were able to politely banter with one another. She invited me over to her house for a play date. And the potential relationship died an instant death. *I* didn't want a play date. And that was clearly what it was about. The term bugs me. :) It doesn't express true affection. Then again, my personality isn't one that feeds off of big group settings. I don't mind structured events (museum for example!) as everyone is engaged and involved with something productive and talk can happen in conjunction with that. I'm comfortable in that. But if I want true and genuine fellowship and relationship, I usually look for it apart from my children. I've never thought of "play-dates" that way before. I've never been involved in one, but I'll never think of them the same again. Sadly, now I'm racking my brain trying to recall if I've ever said Jonathan was "babysitting" the boys. :P Hopefully not! I'm always having things put into a new perspective over here. ...er, can I be IN the choir if I'm just a fan of the SAHM? Okay, I promise I had not read this before I messaged you. Too funny though! "a love for the role that they have been called by God to fill". yeah, some days I'm definitely missing the love. Just wanted to add, that your reasons for not liking play dates are similar to my reasons for not liking "drop-off" parties. NOT a fan.